5 x 7mm natural emerald cut citrine stone in a solitaire setting. Oval or rectangle shapes are available. Requests for all other gemstones are welcome! Other options linked below and shown in later photos above. I craft the sterling silver ring band and mount for each of these using traditional silversmithing techniques, then solder on the tiny brass bee stampings to flank the stones. 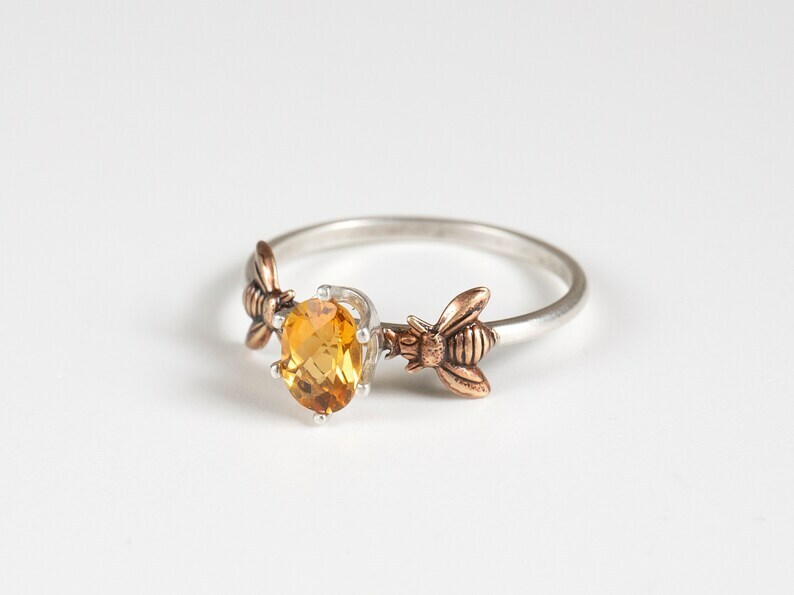 After I am pleased with the ring, I prong-set your citrine. With each one being fully hand-made from start to finish, they are not completely flawless and perfect, but rather each has character! Citrine are relatively durable stones, though you should still exercise care when wearing. I recommend you remove before exercise, bathing, or swimming. Restore shine to the metal with a commercial silver polishing cloth (such as a sunshine cloth). I do not recommend a liquid cleaner as it will remove the oxidation from the little brass bees and harm the stone. Also available in a 14k gold band/brass version. I'm happy to also set a different gemstone- please send me requests for a price quote. Great gift for any beekeeper, gardener, queen bee, or nature-lover in your life. My standard gift box with string bow is protected with a stamped reusable cotton pouch. Makes opening your gift a bit more of an experience! Beautiful! Shop owner did an amazing job! Can’t stop looking at it! Communication was great! So in love. Looks just like the photo. Have gotten lots of compliments on it. Would buy from seller again. The only thing I'm not crazy about is how it catches on the chain if you need to adjust the chain around your neck. Payment for items is due at time of sale, via the above methods. NY state residents will have 8.875% sales tax added to their orders automatically at check out. RETURNS/EXCHANGES: If you are unsatisfied with your item, please contact me and I will be happy to exchange it, or return non-custom and non-sale items. For exchanges, you will pay for shipping from your end, and I will pay from mine. For returns, I will refund your full cost minus shipping as soon as I receive your item. You must keep your tracking number when mailing back your item, so that we know if it goes missing in the mail. REPAIRS: Repairs of broken chain, re-sizing rings etc are available for a materials fee + shipping cost. Occasionally there are chains with defaults in the links which can snap through no mistreatment. If your necklace chain breaks within the first month of wear, I will replace it at no cost. CUSTOM ITEMS: Custom orders are not returnable or exchangeable. This includes any engraving, custom carvings or etchings, very long or very short necklaces in custom lengths, or any adjusted standard designs (cropping a dog's tail etc). I want you to be happy with your purchase, so if you have any problems, feel free to contact me and we will work something out. PACKAGING: All jewelry is shipped in a small box hand-stamped with my logo, and tied with a ribbon. If it says so in the listing, it will also come with a polishing swatch and a care card. I'm also happy to include any personal notes! RECEIPTS: I do not include any paper receipt, so please keep your Etsy emails for your financial records. ADDRESS: I print my shipping labels directly from your order on Etsy, so please verify your address before finalizing the purchase. If you check out with the wrong address and the package is returned to me, I will send you a new shipping invoice and then re-ship. I ship via USPS first class mail with delivery confirmation and insurance. TRACKING: Go to "Your Account" in the top right corner, and then to "Purchases," then click on the item you would like to check on. I will ship most items within 5 business days of your purchase, unless it is noted in the description or on my homepage (vacation, order delays etc). Some items are completely made to order, and ship within 1 or 2 weeks. This is stated in the listing. UPGRADES: I also offer Priority Mail, which will ship within the item's listed shipping window unless we have made other arrangements. PICK-UP: I do not have a public studio for picking up items in person. I am happy to ship all items internationally, via USPS first class mail. Tracking is not always available once it reaches your country. Please allow at least 5 weeks for international deliveries. After that I can file an insurance claim and replace your item. It will not normally take that long, but sometimes things are held at customs for no discernible reason. FEES, GST, AND VAT: International customers are responsible for all customs fees, taxes, and duties associated with shipping to their respective countries. Any customs fees, duties, etc. that may be incurred at the time of delivery would be at the discretion of your country's tax regulations. For any additional information please refer to your local customs agency. http://www.dutycalculator.com/new-import-duty-and-tax-calculation/ All items are shipped with indication of their full retail value for customs. I will not ship merchandise as a "gift". Refunds due to unclaimed packages or items declined due to VAT charges are given once I receive your returned international order, *minus the original shipping cost*. Please understand your country's VAT before ordering. UPGRADE: If you are in a hurry, I can ship via Priority Mail International, which takes 6-10 business days *on average*. Please send me your address for a price quote. It starts around US $30. Jewelry that needs polishing comes with a polishing swatch and care info on a card. Most items that can tarnish also come with an airtight baggie and anti-tarnish swatch for storage. You can find additional care info in each item's details. Silver jewelry can be polished with any commercial polishing cloth. I don't recommend liquid cleaners as this will remove the detail oxidation. Can you carve or etch a particular animal or skyline for me? I am happy to create custom orders. If there is an etching or carving you would like that I believe I can add to my line, it will be similarly priced to other stock items. If it is a unique item just for you, design rates start at about $150, then go up based on how many hours of labor and revisions we need to go through, plus the final cost of materials. Can you cast a bee from my hives into resin? Or use my snake's shedding in an ouroboros? I am also happy to cast your bees into resin, or use your personal snake's shedding on an ouroboros! Just shoot me a convo, and I can send you my shipping address. All jewelry come in the box with ribbon as pictured, and if you select additional gift wrap to be added, I will put that into a nice linen pouch stamped with my logo as well. To be honest, I only added the specific gift wrap option to be included in the Etsy algorithm- all of my jewelry comes packaged gift-ready regardless! Sizing availability is in each item's details. I can make most necklaces and rings any size you like, just shoot me a convo before ordering. Yes I do offer wholesale! You can send me a convo with your email address and store info and I will send line sheets directly. Do you make engagement/wedding rings? Yes! I would love to make something special just for the two of you. Please contact me directly.